The History panel found in the Other Panels list (Ctrl+F10/ +F10) enables you to escape the linear limitations of Undo/Redo. As you work in your project file, the History panel records your editing steps in a sequential list (see Figure 1). The History panel stores steps taken in the active project file during the current editing session only. It does not store steps from the last time you had a project file open or from other files edited during the same session. You can save and move steps from one file or session to another, but it requires you to use some of the special features of the History panel, described later in this section. Figure 1. The History panel lists steps taken as a file is authored or edited. Flash gives you the option of using Document-level Undo (which creates one History/Undo stack for all the items in a current session) or the legacy-style Object-level Undo (which creates a unique History/Undo stack for key editing areas of the Flash authoring environment: Stage, Movie Clip timelines, and the ActionScript panel). The default is set to Document-level Undo, but if you find it helpful to be able to step back through Movie Clip edits individually, you can change this setting in the General section of Flash Preferences. To access the object-level Undo stack, you must open a Movie Clip (not an instance) in Edit mode. Making changes to your Undo style or number of saved steps in Flash Preferences clears the History panel, deleting all the Undo steps for your current session. You can use the History panel as a reminder of the steps taken to create a special graphic effect, or you can use it as a nonlinear authoring control. Should you need to get back to a specific step in your authoring session, you can use Undo (Ctrl+Z/ +Z) over and over and over, or you can simply open the History panel and drag the edit pointer on the left side of the panel upward to go back in time until you reach the point at which you want to jump back into authoring. As long as you don't make any edits at an earlier point in the History list, you can easily scroll forward again if you need to redo your steps — without wearing out the Ctrl+Y/ +Y keys! However, if you undo a step (or a series of steps) and then make changes to your project file, you can no longer redo the steps in the History panel. This is where the History panel does behave a little like a time machine — as long as you don't change anything, you can jump backward and forward in time, but as soon as you change something, you lose the option of going "back to the future." Click to the left of a step in the History panel to jump to that point without scrolling. All steps listed after the point that you click will be undone and grayed out until you scroll forward again (or click to the left of an item closer to the bottom of the list). Select sequential items by dragging or by Shift+clicking the text labels in the list. Select nonsequential items by Ctrl+clicking/ +clicking. With a step (or series of steps) selected, you can apply the step(s) to a new item — by selecting the item with the Selection tool and clicking the Replay button or choosing Replay Steps from the options menu. 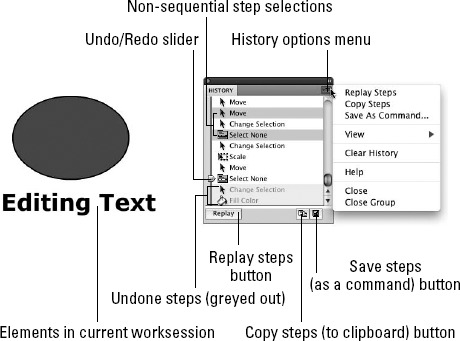 All currently selected steps are applied (in order) to the item, and a new step labeled "Replay Steps" is listed in the History panel. You can use the Replay Steps item in the History list to apply the same steps again without having to select the original steps individually. Select steps from your History panel list (as described in the previous section). Choose Copy Steps from the options menu. In the Flash document where you want to reuse the steps, select an item to which you want to apply the steps. Choose Edit => Paste in Center (Ctrl+V/ +V). The editing steps copied from your original file are applied to the item in your current file and a new item is added to the History panel, labeled Paste Steps. This is a helpful command to use if you want to start from a clean slate before performing a series of editing steps that you plan to save. Clear History deletes all the listings in the History panel of your current document. You can't undo this choice, but you will see a Warning dialog box that gives you the chance to change your mind before it's too late. (Closing a Flash document also clears the History list.) The number of steps listed in the History panel can be limited by the Undo levels set in the General Flash Preferences dialog box. The default setting is 100, but it can be set as high as 300 or as low as 2. Every item recorded in the History panel eats up some memory and disk space, so choose the lowest setting that suits your authoring style. Select the step(s) from the History panel that you want to save and reuse. Choose Save As Command from the options menu (or click the small disk icon at the bottom right of the History panel). In the Save as Command dialog box, give the command a meaningful name. You might call the steps used to create a fancy custom-type treatment "Headline style." By the magic of Flash, your custom command now appears in the Command menu list. You can apply your specific editing steps in any document by selecting an item and choosing Commands => Headline style (or whatever commands you have created and named).